The Sun Sound is a catchy jingle designed to be played at regular intervals on loudspeakers in outdoor areas, as a friendly reminder for people to protect their skin from the sun. 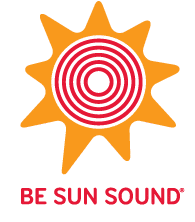 The Sun Sound was produced in 2009 by acclaimed musician Ben Lee and Sony Music and can be heard during summer at selected outdoor venues and sites in Western Australia and throughout the country. 2) Increase the numbers of young people and adults using sun protection elements when outdoors, in response to hearing the Sun Sound. Listen to the Sun Sound below! You can also view the Community Service Announcement below. The SunSmart Van will also broadcast the Sun Sound at community events in Perth. For details about booking the SunSmart Van to attend your event click here. The Sun Sound is designed to be played at outdoor areas such as the beach, sporting events and leisure areas where people are exposed to the sun throughout the day. It can also be played at a range of different locations and events. If you think the Sun Sound will help your patrons to remember to use sun protection, we’d love to hear from you! Please email sunsmart@cancerwa.asn.au with a description of your venue/event and why you think it would be suited to the Sun Sound.